Fortunately the big town fire of 1701 didn’t spread as far as the Old Town Hall, and so this magnificent half-timbered building was preserved. It was built in 1422/23 as a sales hall and tax house for the Imperial City and is a wonderful example of carpentry craftsmanship in the 15th century. 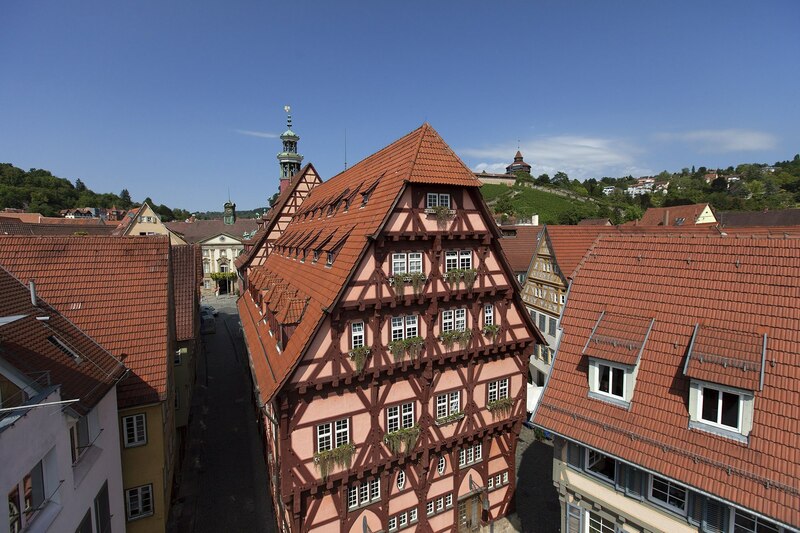 The characteristic feature in the half-timbering is the outstretched X of the “Swabian Man”, which gave the storeys their stability. The spacious ground-level hall inside was used mainly for selling bread and meat. On the upper floor a festive hall was even then used for dancing. It was here that the town’s patricians once enjoyed themselves. The front façade of the Old Town Hall is a surprise because this building has two different facets.